Running a successful owner operator business requires having multiple elements in place like permits, insurance, etc, but there is one other very important element that many owner operators tend to overlook, this important element is a good relationship with your dispatcher. A dispatcher plays a very important part that makes the driver’s job possible, therefore having a good relationship with a great dispatcher as an ally is essential. Statistically, it has been proven that drivers who become friends with their dispatchers tend to make more money on the long-run that those who don’t develop this kind of connection. Friendship essentially involves trusting that each person will do what’s in the best interest of the other one. In this case, your dispatcher will work to get you the best loads available at the moment. Ironically, some owner operators tend to believe more in the information they overheard at a truck stop conversation than what their dispatcher is telling them. It doesn’t make sense to believe in a complete stranger who more often than not could be boasting, instead of trusting your dispatcher who has a finger on the pulse of the market every day. Understanding how your dispatcher works to get you the loads you need is a very good starting point in establishing a good business relationship. Also, putting your trust in him will help to turn this partnership into a friendship. Part of a dispatcher’s job is to schedule loads for drivers to pick up and deliver to customers and vendors, but this is just the tip of the iceberg. Dispatchers are trained to negotiate cargo at better rates in order to benefit owner operators considering many factors like fuel prices, distance, and other fees that a regular person may not even consider. The idea is to find the best paying loads that will align with the driver’s location and desired route. Sometimes combining all these factors may seem impossible, but your dispatcher does this every day. Performing this task requires a variety of skills, from learning company specific computer programs to sometimes being able to speak multiple languages. Strong communication skills are essential for a good dispatcher. The ability to communicate information clearly to assure truck drivers understand their instructions can help them to save time and, consequently, money. Besides keeping track of loads for multiple drivers, dispatchers also have the responsibility of keeping records of bills of lading, lumper receipts, bill receipts, etc. 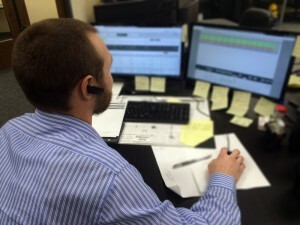 A dispatcher’s job requires excellent time management skills due to the high-pressure and fast-paced environment. The ability to prioritize multiple driver schedules demands high levels of concentration for extended periods of time that can be very stressful. Dispatchers understand that they have to be on their “A” game from the time they punch in, to the time they punch out, and there is rarely any downtime. Dispatchers have a full spectrum view in real time of how loads are constantly changing. This means they are not limited to a single route and something that happened two or three days ago. A good load can be gone in a matter of seconds. If you receive a call from your dispatcher is because he or she has already combed through all the information available at the moment. At Status Transportation, we want to invite you to become friends with your dispatcher. As a result, you will increase the number of friends you have and at the same time this will also turn out to be beneficial to your owner operator business.